A Content Delivery Platform is a software solution that collects content from existing sources, transforms this content into actionable information, and makes it accessible to applications and processes. Content is fetched from various sources: textual documents, structured and unstructured records. To become actionable information, content is turned into fine-grained elements, enriched and reconciled. Applications and processes access information in a contextual and tailored way. Content consumption is analyzed to increase engagement proactivity. The CDP is complementing, rather than replacing or modifying, the authoring environments and other applications that are generating, storing and managing content. As these applications are usually designed for a specific purpose (CRM, helpdesk tools, Web CMS, wikis, file servers, etc. ), they are not suited for fueling other channels by adapting the content to the target end-point. It creates a single access point, one place to unify all information necessary to solve specific business challenges across the enterprise. It brings consistency to content formats and metadata. It applies security rules adapted to the delivery situations and to the profile of the users, controlled in a central manner. A Content Delivery Platform is not just static content, pre-generated and dumped somewhere on a web server or in a database with a search engine on top. It goes far beyond by adding business logics, being able to serve information contextually, dynamically tailored to the user, to the channel and the moment. To solve this complexity, a Content Delivery Platform requires strong core capabilities and relies on technologically advanced components. 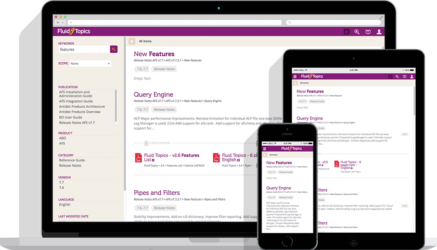 Ingest any type of content, either structured (from databases, knowledge bases, spare parts catalogs, etc.) or unstructured (PDFs, HTML, etc.) This requires a specific back-end for fetching and processing content, that is extensible (add more sources and content types as needed), programmable (APIs and scripting mechanisms allow building processing pipelines), and manageable (tools for monitoring the jobs and checking content validity). Strong metadata management with the ability to extract metadata from content, to align (rewrite) metadata in order to make it consistent across sources, to automatically tag content (enrichment) by using advanced AI and machine learning-based algorithms, and to track metadata origin and changes for compliance. Bulletproof content repository that serves content fast and securely, scaling in all dimensions to cope with unlimited content volume and traffic increase. 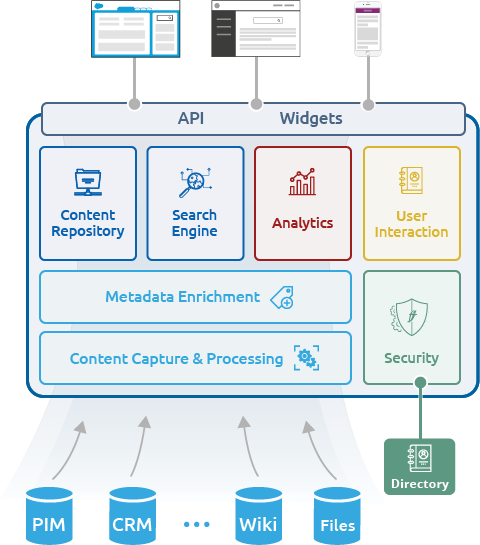 The content repository must provide APIs for easy integration, as well as multiple extensions, widgets and libraries for turnkey and channel-optimized integration. Incredible search engine – full-text, faceted, semantic, secured, personalized and self-improving. 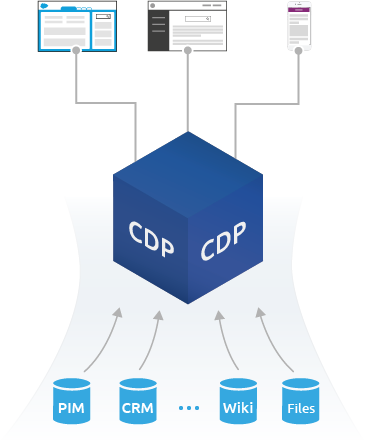 Search is at the very center of the CDP and excellence is not an option. Interact with content beyond reading, in order to capitalize on existing information. Features such as: bookmark, comment and annotate, reuse and personalize pieces of content, create alerts to be notified on content changing or appearing, etc. are key elements of a modern engaging content delivery platform. Embedded analytics system so that the CDP can learn from the searches and the interactions of the users, analyze their content consumption in order to personalize the search results and develop proactive content recommendation. The tight integration of analytics is certainly what makes the distinction between CDPs. Integrate with enterprise security infrastructure to enforce access to content through dynamically configurable rules. Content Delivery Platforms can be specialized to specific business domains. Packaged and pre-configured to ingest content from common sources and formats. Metadata management scheme matching the business needs. Connectors, turnkey apps and integration add-ons matching the environment for rapid deployment. Fluid Topics is the most advanced CDP, dedicated to deliver product information in order to transform customer support, field maintenance, and boost client satisfaction.